I'm so behind on posting! We've been busy kicking off the summer so there will be more pictures to come. 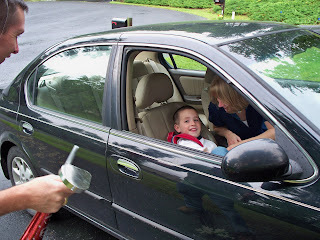 Kyle's mom came for a few days that happened to fall on Will's last day of school. 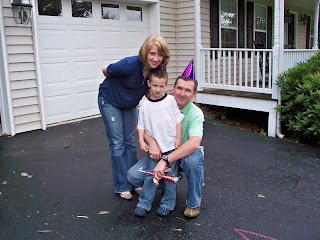 She threw a mini-party for him when he came home from the bus stop welcoming him to first grade. She also experienced t-ball and fishing at our neighborhood lake. 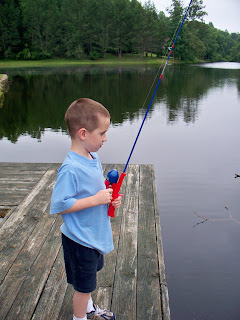 Will caught his fish all by himself from casting to reeling it in! 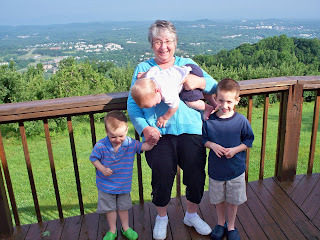 A view overlooking CVille, about a mile from our house. Mini-party. I look pregnant here but I am most definitely not. He was not sure what to do with all the ruckus. 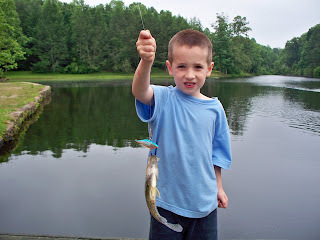 Will's fish! His biggest to date. 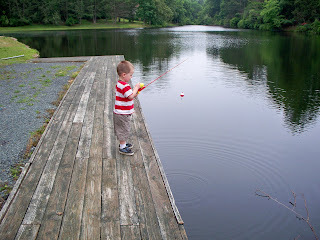 Reese isn't allowed to have a hook yet, but he loves to cast by dropping the lure into the water.